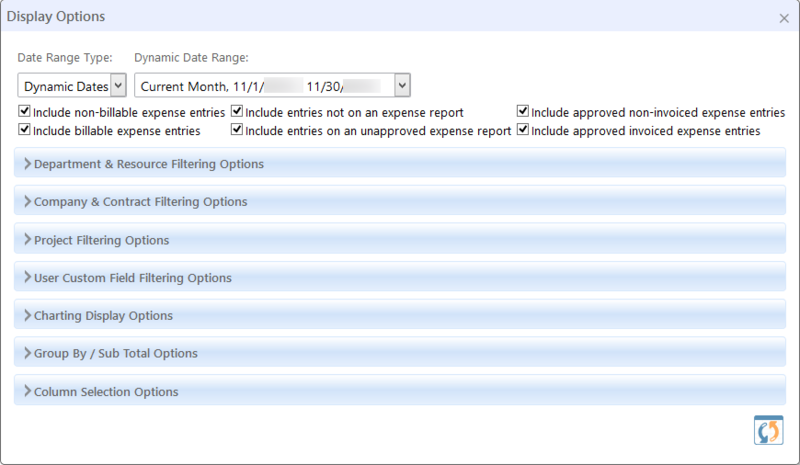 Expense entry reports initially display filtered on the current month. You can easily change the date range and many other conditions in order to create a report with all or only certain expense entries. For example, you may only want to see approved, non-invoiced expense entries which are billable to get an idea as to the expense entries which have not yet been included in the revenue reporting from accounting. The initial display above includes the option to select date ranges for the report. Setting dates allows for the selection of a "Date Range Type"," the first of which is a "Dynamic Dates" selection. 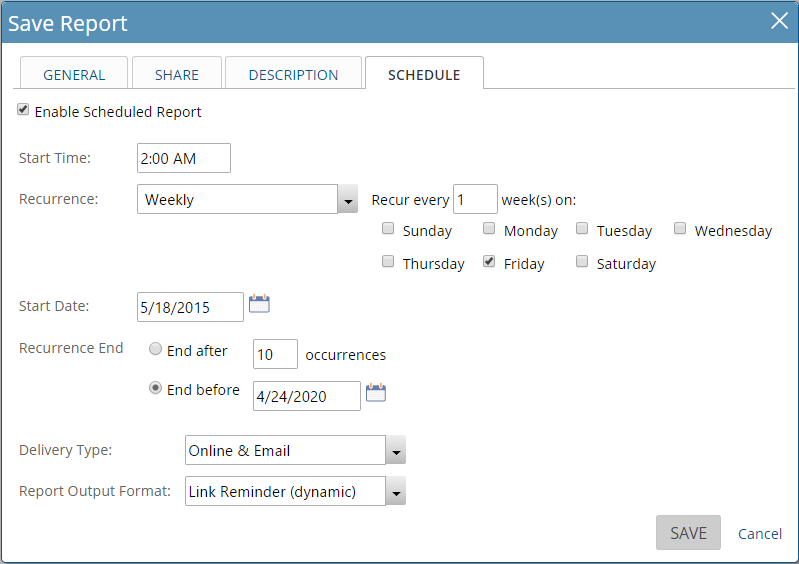 Dynamic Dates - Are a preset ranges of dates that are commonly used, such as current week, current month, last month, next year and that change automatically. If a report is saved with these settings or a filter is remembered with these settings, the next time report is run of the filter is applied, the date range will change automatically relative to the current date. For example, if the current month is October, selecting "Current Month" as a Dynamic Date Range will automatically set the date range to Oct 1 to Oct 31st. If the current month then becomes November, the date range will reset automatically to Nov 1 to Nov 30. The report or filter does not have to be changed as the range changes automatically. The six check boxes below the Date Range Type will include or exclude the resulting expense entries on the report based on which boxes are checked. Company & Contract Filtering Options are used to select certain Companies and/or Company Contracts. Include company specific expense entries that are not associated with a project. Expenses may be entered without attachment to a task or a project for companies that have been set up by the Project Insight administrator to allow direct expense entries. Checking this option ensures that all expense entries are reported without a requirement of the expense having an association with a specific project and/or task. Selected companies MUST be associated to the task directly, or the company must be associated to the project as the default company for the project. Expense entries within a project may be made to tasks set with properties to charge the expense to a company other than the default company for the project. Checking this option will make certain that expenses within the project that should not be charged to the company in the filter is NOT included. Selected company contracts MUST be associated to the task directly, or the company contract must be associated to the project as the default company contract for the project. Expense entries within a project may be made to tasks set with properties to charge the expense to a contract other than the default contract for the project. Checking this option will make certain that expenses within the project that should not be charged to the contract in the filter is NOT included. Several types of Custom Field Filtering Options will display if your Project Insight administrator has added them. Information on setting a custom task data field as a report filter is contained in the User Defined Fields and Forms topic. The image below is an example of how a user custom field named Skill Set would appear. Predefined allows for a drop down selection of any charts that have been predefined. Custom Chart allows for selection of information to create a chart. Chart Type includes six different types of charts that can be created. These include Area, Bar, Column, Donut, Line and Pie. Aggregate By enables a selection of data field to aggregate upon. Chart Column enables a selection of columns for data for the chart to use. Aggregate Type enables you to select Sum, Average, Count, Max or Min for the column of data. Hide # enables you to hide the number for the data. Stacked enables you to stack the data. *Note there is an add icon at the end of the row which allows you to add multiple rows of data fields for the chart. Aggregate By is the y-axis and the Chart Columns is the x-axis. Aggregate By is the x-axis and the Chart Columns is the y-axis. Tile Charts Vertically will change the output of more than one chart so that the charts display in a single, left-justified column as opposed to a horizontal display (side-by-side) across the top of the page. Include the Table Results with the Charts will display the report with the report data supporting the chart(s) in a table format below the chart(s) display. The table results are simply a report which is identical to what you would see if you ran the report without using the Charting Display options. The report can be grouped by column names or sorted by column names in either ascending or descending order.You can also stack several choices and group within groups or sort within sorts. Column Selection Filtering Options will control the data fields displayed as columns for the resulting output of the report. Detailed information for setting preferences in the data field column displays is contained in the Column Display Options topic. 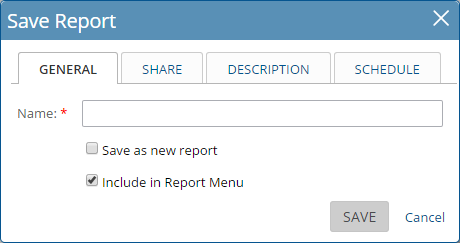 After selecting your display options for the report click on the run report button On the General tab for saved reports, you can choose to include the report in the Report Menu. This places the report in the drop-down, fly-out menu of the global report navigation. The report will be available on that menu for you and for anybody who also has the report by way of sharing it with them. There may also be an option to save as new report if the report you're using originated from a previously saved report. Save as new will save a new report without overwriting any changes you've made to the previously saved report. Saving as new does not force a name change to the saved report, but it is always a good idea to change the name anyway so that you do not have two different reports with the same name. If the report you are saving was shared to you by another user as the original report creator, the save as new report option is the only option available. You cannot make and save modifications to a report created by another person, but rather you will save your own new report. The Share tab allows you to share with Groups, Companies and Users. 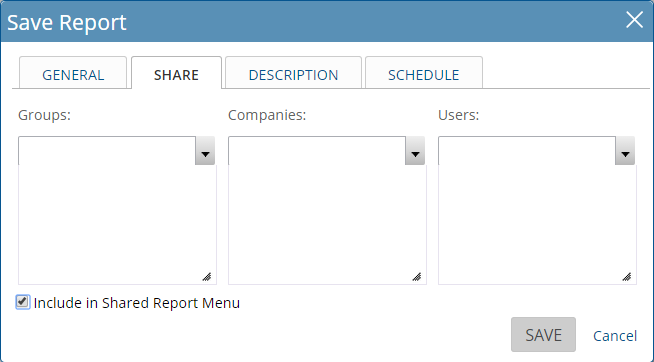 If the report is relevant to multiple users, you may find that Companies or Groups are the best way to make sure that the report is not only shared with all of the appropriate users, but also that any new users added to the Company and/or Group automatically get the shared report. There is an important distinction between shared users on reports and shared users for scheduled reports which must be understood whenever sharing reports with sensitive data. Shared users accessing a link to the report, whether through the application interface or an email link, will run a query which presents the data based on the specific user's permissions, settings and access rights. A shared user accessing a report which was saved as static data (i.e. spreadsheet or PDF file) when the schedule was run will see the exact same results as the creator of the report because the report was run and saved under the settings of the report creator as static data for the other users to view. This important distinction is re-iterated in the explanation of the Report Output Format in the scheduled report settings. The Description tab is a reference to any information you'd like to add which may help to explain the purpose of the report in more detail than you would normally include in the simple saved name for the report. The Schedule tab is used to run the report and send a reminder with a link to the report that was run at the selected interval for the report. If the Report Output Format is Link Reminder (dynamic), the scheduled report is simply a URL/link reminder which will run a query and display the real-time data as a result of the query. It does not save static data from the time of the execution of the scheduled report. If the Report Output Type is not Link Reminder (dynamic), for example it is a spreadsheet or PDF format, the data is saved as static information at the time of the execution of the report. A shared user accessing the report which was saved as static data when the schedule was run will see the exact same results as the creator of the report because the report was run and saved under the settings of the report creator as static data for the other users to view. It is important to note this distinction because the receiver of the scheduled report may see data in the results which they would not otherwise have access to view.